THIS ITEM IS NOT AVAILABLE AT PRESENT. WE WILL NOT BE GETTING ANYMORE Back to the Future Part III DeLorean Vehicle. From the Back to the Future collection by Diamond Select. Back to the Future Part III DeLorean Vehicle. 1/15th scale Back to the Future Part III DeLorean Vehicle. Includes time-traveling lights and sounds. Requires 3 AA batteries that are included. 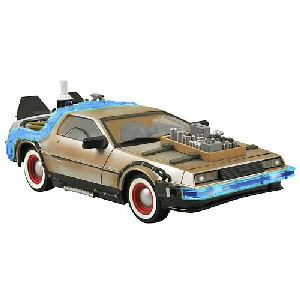 Diamond Select Back to the Future Die Cast shipping from Canada. No Surprise Border fees or Customs!